World cabinet demand will rise 5.5 percent annually to $64 billion in 2018. The US will remain the largest market and will rebound from recent declines. The Asia/Pacific region will see robust growth, led by China and India. Kitchen cabinets will remain dominant while other types such as garage and office cabinets lead gains. 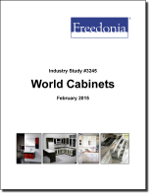 This study analyzes the $49 billion world cabinet industry. It presents historical demand data (2003, 2008 and 2013) and forecasts (2018 and 2023) by market (residential, nonresidential), application (e.g., kitchen, bathroom), world region, and for 18 countries. The study also considers market environment factors, details industry structure, evaluates company market share, and profiles 31 industry players, including LIXIL Group, MasterBrand Cabinets, and IKEA.